Poverty measurement brings together elements from all branches of the statistical system. At the core is a household survey that is representative of the relevant population and includes questions needed for developing a comprehensive measure of household consumption or income. 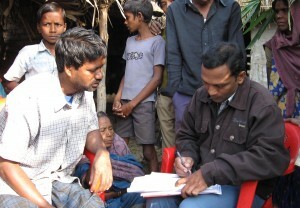 Pilot testing a new survey in rural Bihar. This was done for the study of India’s National Rural Employment Guarantee Scheme, as discussed in the page on targeted antipoverty programs. In addition, one needs data on the prices faced around the time and place of the household interview. Depending on the setting and application one may need other data, such as from the population census or national accounts. The quality of these data inputs is, of course, crucial to the reliability of the measurements. In addition, there are also a number of conceptual and methodological issues to be considered in using these data. There has been huge progress in expanding the availability of household survey data for the developing world over the last 25 years or so. But many data issues remain. Going forward: What is needed for better global poverty measures? Here is Ravallion’s answer: Toward Better Global Poverty Measures. One specific area of concern has been the task of making international price level comparisons. The 2011 Purchasing Power Parity rates released by the International Comparison Program in 2014 held surprises for many countries, including India. This paper tries to make some sense of the revisions, though puzzles remain: The ICP’s new global economic landscape. One thing is very clear: the ICP needs to be more open about public access to the micro price data they collect. Part 2 of EOP discusses further the issues involved in measuring poverty and inequality. The best data available indicate that there has been much progress in reducing the incidence of extreme poverty in the developing world over the last 30 years. 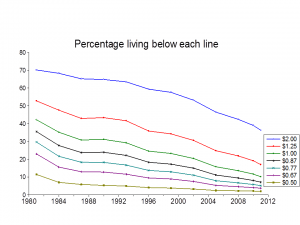 The graph below gives the % of the population of the developing world living in poverty for various poverty lines (EOP, Chapter 7). (The monetary units are 2005 PPP $’s per person per day.) 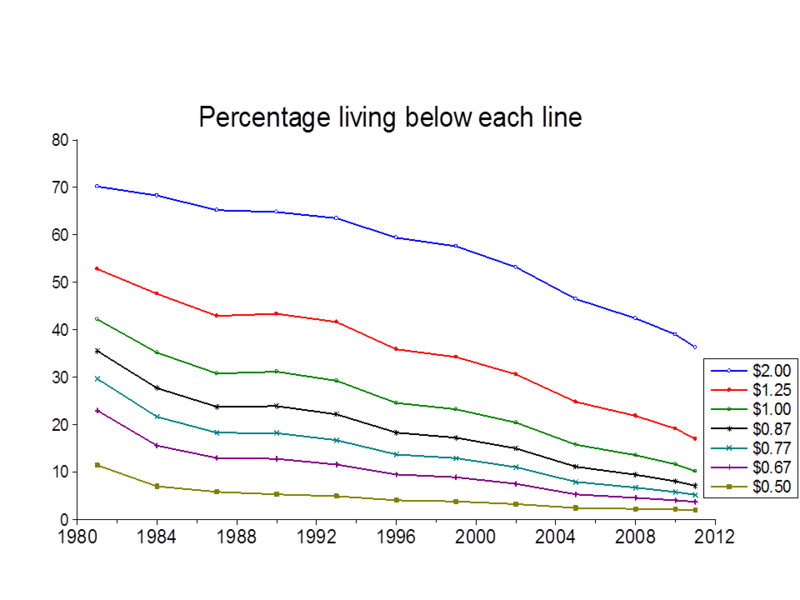 Since the turn of the present century, numbers of poor have been falling in all regions.